Shigella is an important cause of bacterial gastroenteritis in resource-poor countries. The treatment of shigellosis mostly requires antibiotics. However, the increase of multidrug resistance along with emergence of extended-spectrum β-lactamase and ciprofloxacin resistance among Shigella spp. has challenged the situation. This study was conducted to determine the distribution of species and antibiotic susceptibility pattern of Shigella species isolated from stool specimen among children less than 5 years of age in Nepal. Out of total 717 stool samples collected, 15 cases of Shigella spp. was isolated which includes 12 S. flexneri and 3 S. sonnei. Multidrug resistance was found among 13(86%) of the isolates. One of the isolates of S. flexneri was found to be ESBL-producer with MIC >256 mg/L for cefixime. The high occurrence of multidrug resistance among Shigella spp. along with a case of ESBL-production for the first time in Nepal alarms the concerns about dissemination of the resistant isolates. So, systemic monitoring of the antimicrobial susceptibility pattern of Shigella spp. is becoming crucial to guide therapy. Shigella is an important cause of bacterial gastroenteritis in resource-poor countries where children less than 5 years of age are major affected population . Antimicrobial agents can lessen the severity of disease and potentially prevent lethal complications; however, sulphonamide–trimethoprim, tetracycline, ampicillin are no longer recommended for empirical treatment because of the high chances of resistance . In addition, the increase of multidrug resistance along with emergence of extended-spectrum β-lactamase (ESBL) and/or ciprofloxacin resistance among Shigella spp. has made the situation challenging [3–6]. In current scenario, majority of the members of the family Enterobacteriaceae were shown to produce ESBL including Shigella. Third-generation cephalosporin-resistant S. flexneri isolate was first reported from a stool sample of a 16-month old child in Paris in 1995 . In the recent years, various ESBL-producing Shigella were also reported from Korea , Argentina , Vietnam , Turkey  and India . The free access of antibiotics from pharmacy without prescription, lack of antibiotic policy and dedicated laboratory for susceptibility testing and surveillance is leading to distressing public health threat of antibiotic resistance in Nepal. The prevalence of ESBL in Nepal is found to be 13–24% in different clinical isolates, predominantly Escherichia coli [13–15]. ESBLs are beta-lactamases capable of conferring bacterial resistance to the penicillins, first-, second-, and third-generation cephalosporins, and aztreonam except the cephamycins or carbapenems with various genotypes such as CTX-M, TEM, SHV, OXA . Though extended-spectrum β-lactamase production in Shigella has not been reported from Nepal, the transfer of ESBL genes to Shigella spp. is possible through mobile genetic elements and plasmids . This study was conducted to determine the distribution of species and antibiotic susceptibility pattern of Shigella species isolated from stool specimen of children less than 5 years of age in Nepal. Single stool samples were collected from the children less than 5 years of age attending two referral hospitals in Kathmandu, Tribhuvan University Teaching Hospital (TUTH) and Kanti Childrens’ Hospital, from January to December 2014, with acute diarrheal illness. These hospitals are large centers in the country taking care of around 1500 acute diarrheal cases in observation ward and OPD services in a year. In the study, children admitted in hospital for longer than 3 days and/or in antibiotic use were followed as exclusion criteria. The laboratory investigation was performed following the technical guidelines of American Society for Microbiology at Department of Microbiology, TUTH . The direct inoculation of stool sample was done in Xylose Lysine Deoxycholate Agar (XLD) while 6 h enriched Gram Negative broth were cultured into MacConkey agar (MA) and incubated at 37 °C for 24 h. Non lactose fermenting pale colonies from MA or pink colonies from XLD were tested for indole production, citrate utilization, urease production, lysine decarboxylation, acid and gas production with sugar utilization and motility. Presumptive Shigella isolates were serotyped based on serological slide agglutination, using the polyvalent antisera A–D (Shigella Antisera, Denka Seiken, Japan). The antibiotic sensitivity tests of Shigella spp. were performed using following antibiotic disks (Hi-media, Mumbai, India): amoxicillin (10 μg), nalidixic acid (10 μg), cotrimoxazole (1.25 μg/23.75 μg), ciprofloxacin (5 μg), azithromycin , tetracycline (10 μg), cefixime (5 μg), ceftriaxone (30 μg), ceftazidime (30 μg), ampicillin/sulbactam (10 μg/10 μg) and interpreted as recommended by CLSI . The isolates having resistant zone diameters against cefixime, ceftriaxone or ceftazidime were further tested for Minimum Inhibitory Concentration (MIC) of cefixime by agar dilution and ESBL was confirmed by phenotypic disk diffusion methods, double disk synergy test and combination disk method, depicted in Fig. 1 as described by CLSI . For combination disk method, ≥5 mm increase in a zone diameter for either third generation cephalsporin tested in combination with clavulanic acid versus its zone when tested alone was used as interpretative criteria to confirm an ESBL-production. In the study, total fifteen Shigella isolates were identified (2.1% of total cases). Shigella flexneri was isolated from 12 cases whereas Shigella sonnei was isolated from three cases. The antibiotic sensitivity pattern of Shigella spp. depicts that 33% of the isolates were sensitive to amoxicillin, cotrimoxazole and ciprofloxacin and one isolate is resistant to third generation cephalosporin, which is presented in Table 1. MDR pattern of Shigella spp. Out of total 15 isolates, 13 isolates were found to be multidrug resistant representing 86% of the total isolates. The MDR pattern of Shigella spp. is presented in Table 2. Out of 15 isolates, 14 isolates had cefixime MIC ≤0.5 mg/L and one of the isolate had >256 mg/L. 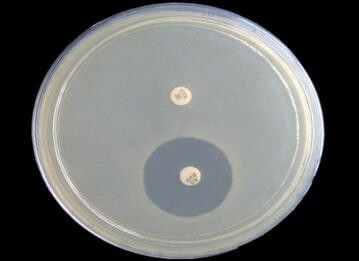 One of the S. flexneri isolate was found to be ESBL-producer, in fact a multidrug resistant, being resistant to ciprofloxacin, cotrimoxazole and third generation cephalosporin. The study was conducted from January to December 2014 among children less than 5 years suffering from acute diarrhea, attending inpatient and outpatient department of Tribhuvan University Teaching Hospital and Kanti Children’s Hospital. In the study, Shigella spp. were isolated from 2.1% of total cases. Shigella flexneri was isolated from 12 cases whereas S. sonnei was isolated from three cases. Similar to this study, Shah et al. reported that Shigella species accounted for 2.24% of total cases and S. flexneri was the only isolated species . In accordance to the present study, S. flexneri has been found to be major cause of shigellosis in developing countries . Zhang et al. reported S. flexneri among 78.7% cases from China . However, in a study conducted at Eastern Nepal by Bhattacharya et al. the predominant isolate was Shigella dysenteriae (73.7%), followed by S. flexneri (23%) and Shigella boydii (4%). In studies made in Nepal, from 1999 to 2002 S. flexneri accounted for 38% and was behind S. dysenteriae (42%) while in study made from 2003 to 2005, S. flexneri (43.22%) was predominant with S. dysenteriae occupying 41.52%. Indeed, authors have marked the shift of predominant species to S. flexneri by 2005 . Similar type of serogroup changes have been reported in other parts of the world as well. During 1984 in Eastern India, epidemics of shigellosis were caused by multidrug resistant S. dysenteriae serotype 1; in the same region after 18 years in 2002, the epidemics of shigellosis were found to be caused by S. flexneri . In this study, third generation cephalosporins were found to be most sensitive antibiotic (93% of Shigella species were sensitive to ceftriaxone) followed by azithromycin. However, 67% of isolates were resistant to amoxicillin, ciprofloxacin and cotrimoxazole. In comparison to S. flexneri (83% of isolates were resistant), S. sonnei was more sensitive to amoxycillin (all isolates were sensitive). In reverse, 42% of isolates of S. flexneri were sensitive to ciprofloxacin and cotrimoxazole, but all isolates of S. sonnei were resistant to ciprofloxacin and cotrimoxazole. Similar, kind of result have been shown in a study done by Shah et al. in Nepal . In contrast to the developed world, where S. sonnei is common, the occurrence of quinolone resistance is low. For South Asia, S. flexneri continues to be the most common serogroup isolated; antibiotic resistance is emerging including ciprofloxacin resistance . In this study, one of the isolates, S. flexneri was found to be ESBL-producer which accompanied ciprofloxacin resistance along with third generation cephalosporin. Similarly, ESBL has been reported in Shigella species from different parts of the world [10–13]. The ESBL producing Shigella was isolated from 59 months old female child. To our knowledge, this is the first report of ESBL producing Shigella. The isolate is ESBL-producer with MIC >256 mg/L for cefixime and had positive double disk synergy test and combination disk test both. The isolate was sensitive to cefoxitin, eliminating the possibility of AmpC production. However, the lack of generous molecular laboratory facilities didn’t allow genetic characterization, which can be further quest of further study. The emergence of multidrug-resistant (MDR) strains of Shigella is a great concern in South Asia including Nepal . In such a scenario, third-generation cephalosporins are increasingly being used for treating diarrhea where antibiotic is indicated empirically. This, in turn, can lead to the increased prevalence of extended spectrum beta-lactamases (ESBL) producing Shigella sp. The multi drug resistance is increasing steeply among Shigella spp. accompanying third generation cephalosporin resistance as well in some case. So, systemic monitoring of the species and their antimicrobial susceptibility is becoming crucial to guide therapy. First authors: SD is primary and corresponding author who designed the study methodology, performed laboratory investigation and prepared the article for submission. JBS and BPR helped to design the study, helped in performing laboratory investigation, performed proof reading of article and made necessary arrangements of reagents. Second authors: BMP, KP and HPK helped for—literature review, design the study and prepare the laboratory protocols and analyzing the impact of the study. SKM and SS helped in designing the study, data entry, analysis and proof reading of article. SK and S Khatiwada helped during filling consent form, sample collection and drafting the manuscript. All authors read and approved the final manuscript. We would like to acknowledge Ph.D. scholars, IOM-Basudha Shrestha and Shovita Shrestha for guiding on Minimum Inhibitory Concentration technique and providing antibiotic powder. The ethical approval for study was taken from Institutional Review board, Tribhuvan University Teaching Hospital, IOM before sample collection. The issued letter of IRB can be presented on request. The written consent was taken from the guardian of the patients in the local language. The research was supported by Department of Microbiology, Institute of Medicine, Maharajgunj, Kathmandu. World Health Organization. Guidelines for the control of shigellosis including epidemics due to Shigella dysenteriae type 1. Geneva, Switzerland. 2005. http://apps.who.int/iris/bitstream/10665/43252/1/924159330X.pdf. Accessed 5 Nov 2014.